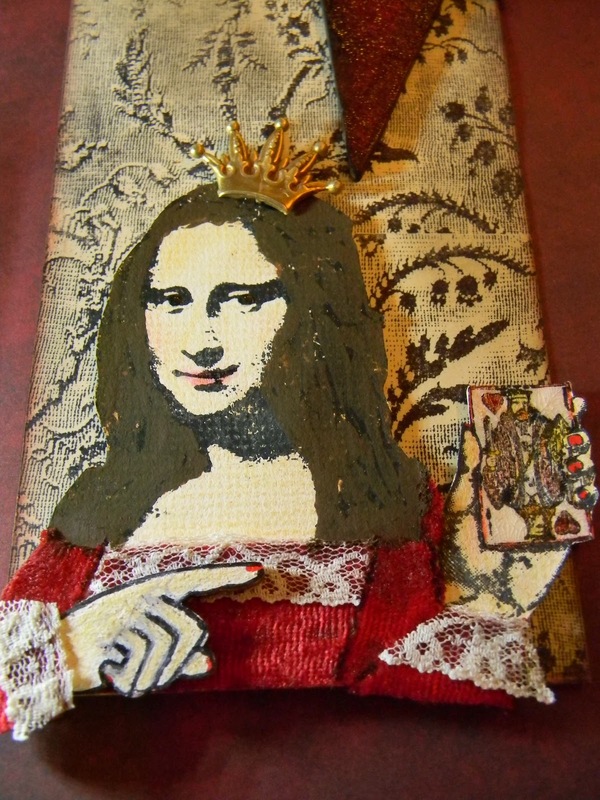 The Artful Maven: Mona Lisa's Smile??? Ah Mona...that unforgettable face, that ambiguous smile. She really is a queen in her own right. After all, she is the most famous painting in all the world. But, just what was she smirking about anyway? Well, there is no doubt what this Mona is looking so bemused about here. It conjures up part of an old Rod Stewart tune...'even "Mona" needs a little passion'. 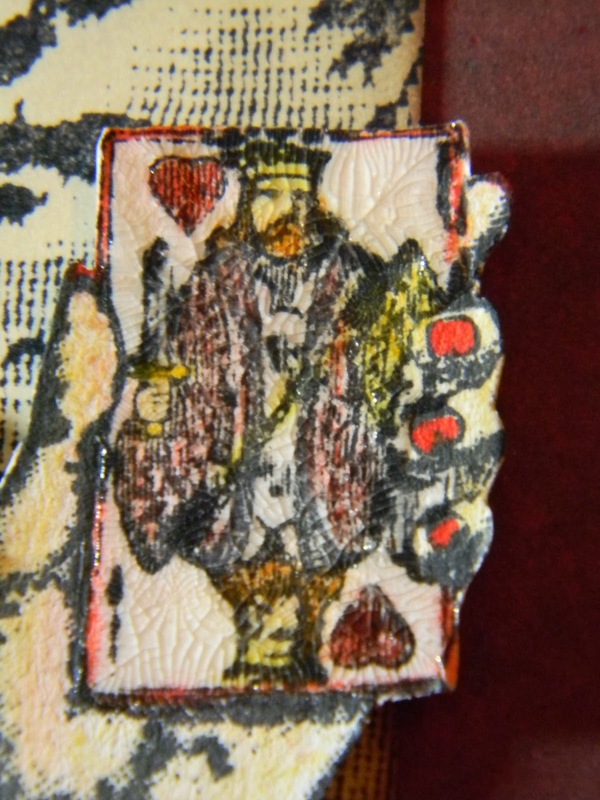 I designed this tag to be used in the "humorous challenge theme" over at the Everything Wendy Vecchi Yahoo Group, and then the Simon Says Stamp and Show posted their challenge this week of "kings and queens", so this was perfect, as well as The Artistic Stamper for "hearts". I stamped both images on white cardstock using Pitch Black Acrylic Paint Dabber so I would get a nice, black, crisp image. I colored them in with watercolor pencils. I painted the Art Part Hand with Snow Cap Acrylic Paint Dabber and then colored it in with the pencils. The card was given a coat of Crackle Accents. Mona's hair was painted wtih Espresso Acrylic Paint Dabber. I stamped the jumbo tag with the background image in Archival Ink. The heart was inked with Fired Brick Distressing Ink, stamped with Snow Cap Acrylic Paint Dabber (Wendy's dots image), crackled with Rock Candy, then inked over with Pumice stone. 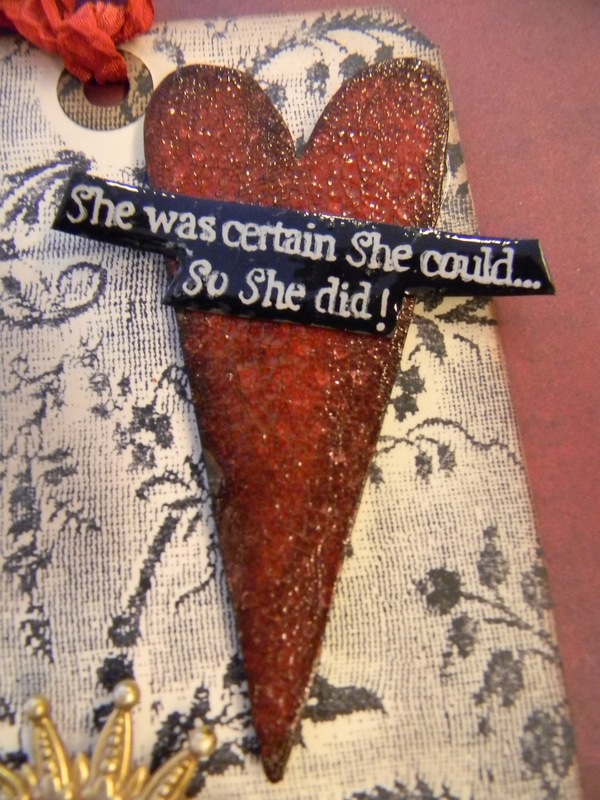 The Wendy sentiment was stamped with Snow Cap as well, and the spots that needed filled in were done with a white pen, then Glossy Accents covered it. This is great! Love that you dressed up mona lisa. The background is stunning. Loving this!! Thank you Eliza!!! I can now translate your comments and you can translate as well using the Google translator up top. Thank you for following me!!! 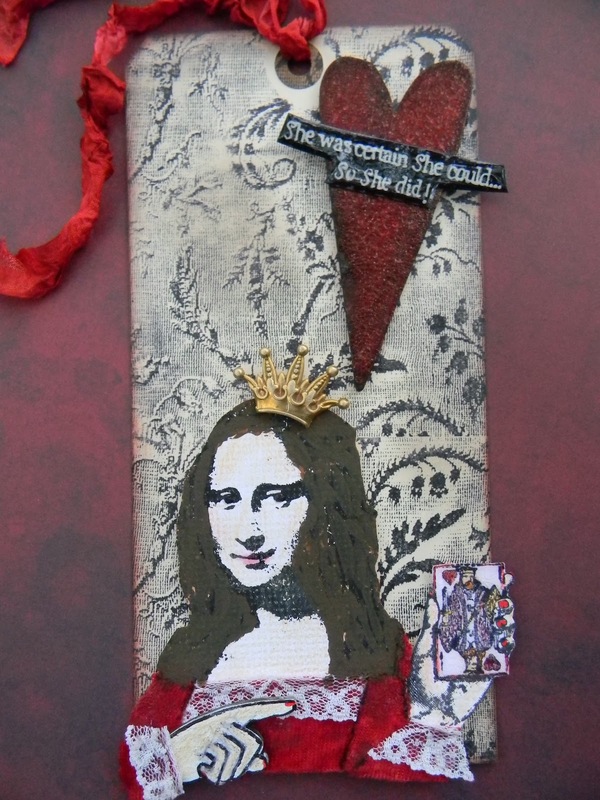 Firstly what an amazingly gorgeous Tag, I love how you used the Black paint Dauber to ink up MONA. The additions of the lace and crown make her special and the crackle Bg adds so much tactile quality, it is just superb. Secondly, thank you for visiting me and leaving such a lovely comment, inspiration will work both ways I feel. Love this, Anita! The background is gorgeous and I can't get over the hands you've given Mona.... fantastic! Very cool tag! Love Mona Lisa and that heart, Wow! Have a great weekend! Oh anita I love this tag...this is more than awesome. love the black dabber art work love the stamps I Love the Tag! Wonderful tag. I NEED that background stamp! Oh, Anita, this is SUPER!! Now i know why she is smiling...she is having the king in her hand! this is a fabulous tag! Mona with hands!!! I love the background and you have inspired me to try my version of this! Thank you for sharing! Hi Anita - LOVE your Mona-Lisa tag! That background by Studio 490 is simply stunning! Thanks for sharing your art with us at Simon Says Stamp and Show! I love those card stamps, they are super cool. This tag is amazing and I love all the "effects" very cool!! Great tag, Anita! Love all your add-ons. Very nice. The background is so classy. Need to study your instructions again for a clear understanding of how you did the background, as I fully intend to blog-lift it! 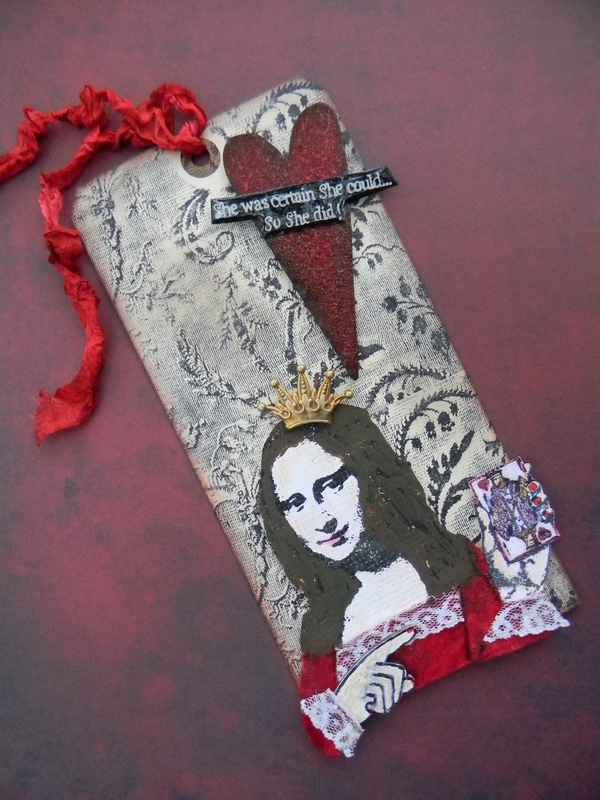 A fabulous tag and I love all the detail...good luck and thank you for joining us at The Artistic Stamper Challenge.